Our detergents and laundry systems are of the very highest quality, but precise dosing with the compact Line® dosing technology by BurnusHychem is what ensures the frugal use of detergent, economical and environmentally friendly laundry care and a high degree of process safety. Three different systems cover all the requirements of a modern laundry. 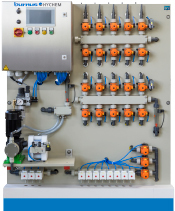 The compact Line® dosing solution combines innovative technology for highly efficient systems with a space-saving, compact design and minimum maintenance and service expenditure. For virtually all dosages, we use one pump that functions with a specially developed valve dispenser. We reduced hoses, additional pumps and assemblies to an absolute minimum. The special pneumatic valve control for the compact Line® eliminates the need for power cables. With our technical solutions, we provide laundries a high degree of operational reliability. BurnusHychem process technicians check and calibrate the dosing systems during their regular service visits. The dosing system by BurnusHychem for smaller washer extractors with a maximum load of 60 kilograms. Only one dosing pump is needed for up to nine products on a maximum of three and five machines. This corresponds to a classic dosing system with 27 and 45 individual dosing pumps. 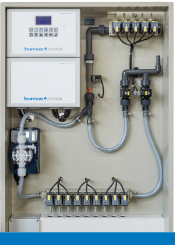 The dosing system by BurnusHychem for washer extractors. 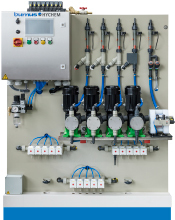 Only one dosing pump is needed for up to eight products on a maximum of 10 machines. The system can be expanded to include 11 products with the use of a second pump. Depending on the maximum load of the machines, dosing pumps with different conveying capacities can be used. This corresponds to a classic dosing system with 80 and 110 dosing pumps. The dosing system by BurnusHychem for conveyor washing machines. It supplies one conveyor washing machine with up to 17 products. Just one pump and up to five products per washing zone: This corresponds to a classic do sing system with 15 dosing pumps. The system shown below is a complete unit with five pumps: three pumps for each washing zone and two pumps for additional products.